EKPC – East Kentucky Power Cooperative | Data is Power. The new PowerVision website and app created by East Kentucky Power Cooperative combines existing data with drone images and engineering renderings to allow prospects to preliminarily assess Kentucky development sites without physically visiting remote properties. East Kentucky Power Cooperative is releasing a dramatic new digital site presentation tool it thinks could change the economic development game in its rural service territory, and maybe for the state. 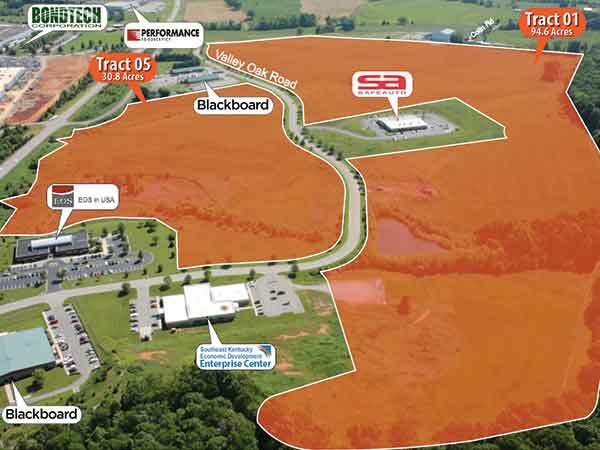 It enables a prospect in Germany or New Jersey to see a Kentucky site in three dimensions, its pertinent infrastructure both existing or as it could be installed, and include renderings of the facility they want to build. The PowerVision web site and associated app for mobile devices combines high-definition aerial drone video of industrial sites with digital topographic mapping and detailed engineering information to create three-dimensional surface models. That’s then merged with data from StateBook, which aggregates community demographic, tax, utility cost, incentive and quality of life information. MANCHESTER — Gov. Steve Beshear and U.S. Rep. Hal Rogers, co-chairs of SOAR – Shaping Our Appalachian Region, joined educators from 22 eastern Kentucky school districts at Clay County High School to help kick-off an education initiative aimed at building a STEM-based (Science, Technology, Engineering and Math) workforce by creating new opportunities for teachers through National Board Certification. App integrates geolocation technology with site selection data for economic development. 60,000 data points from over 50 sources. The software for Powermap was developed by Louisville based mobile app development firm Interapt. With PowerMap, users can either type in a street address or use native GPS tracking on their mobile device to determine whether the location entered falls within the service territory of any of the 16 Kentucky’s Touchstone Energy Cooperatives. In the past, the process of verifying which energy provider serves a certain defined territory would involve several parties, such as the Public Service Commission, and could take several days, if not weeks. PowerMap constitutes a “first-of-its-kind tool” according to Rodney Hitch, Manager for Economic Development. “Economic developers on a site visit can use PowerMap to leverage mapping technology with StateBook’s vast database and instantly retrieve important site data, such as average commuting time, which in the past could have taken weeks,” says Hitch. “Our electric cooperatives are working hard to bring jobs and investment to the communities we serve, and PowerMap is another tool for that effort,” said Anthony “Tony” Campbell, CEO of East Kentucky Power Cooperative. The idea for building the PowerMap app spawned from a discussion about economic development during a recent trade mission to Canada that included Associate Manager Brad Thomas and Interapt CEO Ankur Gopal. PowerMap is part of a suite of economic development efforts by Kentucky’s Touchstone Energy Cooperatives that includes a new economic development website as well as StateBook rollouts of 104 economic development sites for our cooperatives and counties served. The PowerMap application is available for download to Apple devices on the App Store and to Android devices on the Google Play store. The web application is available at www.PowerMapKY.org. Winchester, KY – October 20, 2014 – CEO Tony Campbell today announced that East Kentucky Power Cooperative (EKPC) and its 16 owner-member electric cooperatives have become the first utilities in the nation to sign with StateBook International. The multiyear agreement will provide the co-ops, which serve more than 1 million people in 87 Kentucky counties, with access to the StateBook platform in promotion of economic development sites in their communities. StateBook is the first online marketplace to unite economic development organizations (EDOs), site selectors and communities nationwide in the site-selection process for business locations of both domestic and international firms. Partnering with SelectUSA, the federal government entity charged with showcasing the United States as the world’s premier business location, StateBook provides the perfect access point for site selectors trying to locate the best possible sites for business opportunities. “Statebook allows our communities and cooperatives an opportunity to show people unfamiliar with what the Bluegrass State has to offer a platform that reflects that Kentucky is open for business. Statebook is the perfect showcase to demonstrate what great locations exist in our territories featuring details concerning sites, community, workforce and any other information site selectors need in finding the perfect site.” – Rodney Hitch, Director of Economic Development efforts for East Kentucky Power Cooperative. Rollout of the electric cooperatives and communities sites will take place immediately with customization taking place over the next few months. When it comes to attracting companies to the Bluegrass State, near the top of the list of benefits economic development officials point to is Kentucky’s relatively low cost for reliable power. According to the state Cabinet for Economic Development, last year Kentucky offered the lowest electricity cost of any state east of the Mississippi River and the fourth-lowest overall in the nation – 8.13 cents per kilowatt hour on average across industrial, commercial and residential sectors. But that’s only part of the role electric and gas utilities play in attracting business to the commonwealth. Many are also directly recruiting companies and offering their own local incentives, backstopping public economic development efforts or even directly funding activities by underwriting key trade show visits.